I’m a Disney girl. Some of my earliest memories are family trips to Disney. My favorite job ever was when I did the Walt Disney World College Program in Fall 2003. 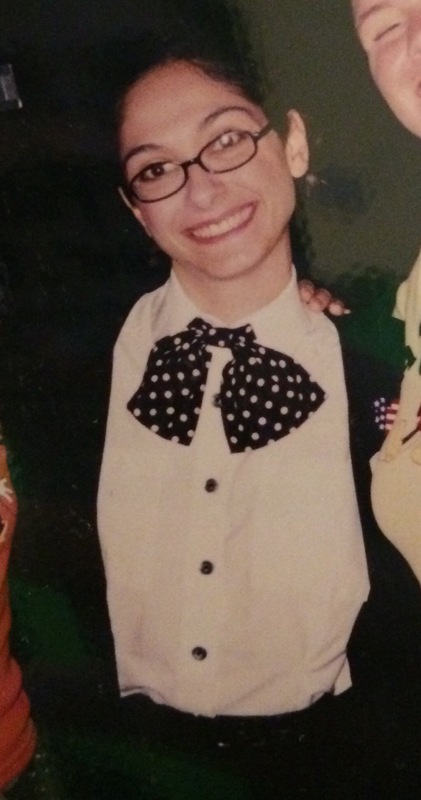 This is me 2003 in my costume working in Disney-MGM studios. Several years later my love of Disney hadn’t gone away. My sister was planning a Disney wedding and met several other Disney brides who were running in Disney’s Marathon Weekend. 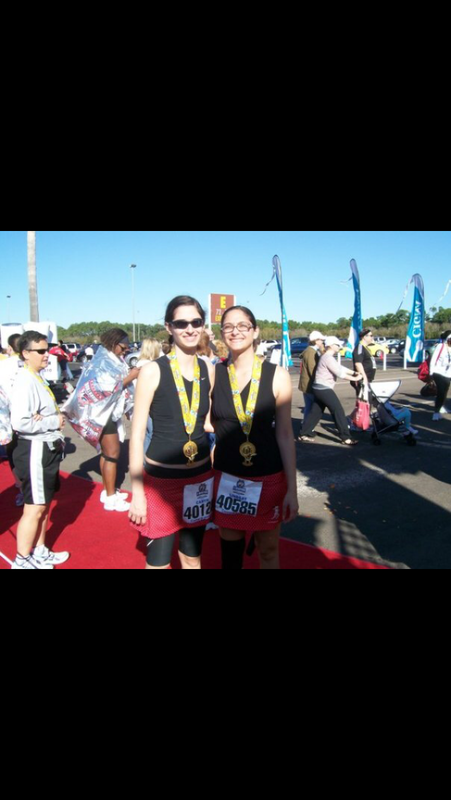 Then one day in 2008 she signed us both up for the half marathon at Disney in 2009. To say that I was in over my head, is an understatement. I had never run before, not a step. I didn’t know about fuel, gear, nothing. I went into that race as a total novice and I had never run more than 8 miles. It was a hard race, but I did it. And as I crossed the finish line with my sister I said I would never do that again. That’s Caryn on the left and me, right. (She will tell you that I’m older. I’m not. We are two years apart almost exactly. She’s older) this was my very first race, my very first medal. It’s very special to me. At the expo for this race (as an aside, I LOVE- love love love- running expos) they were advertising for the first Disney Princess Half Marathon. I know I said when I finished my first half that I’d never do it again. I’ve learned that it takes a few days and then I’m itching to do it again. 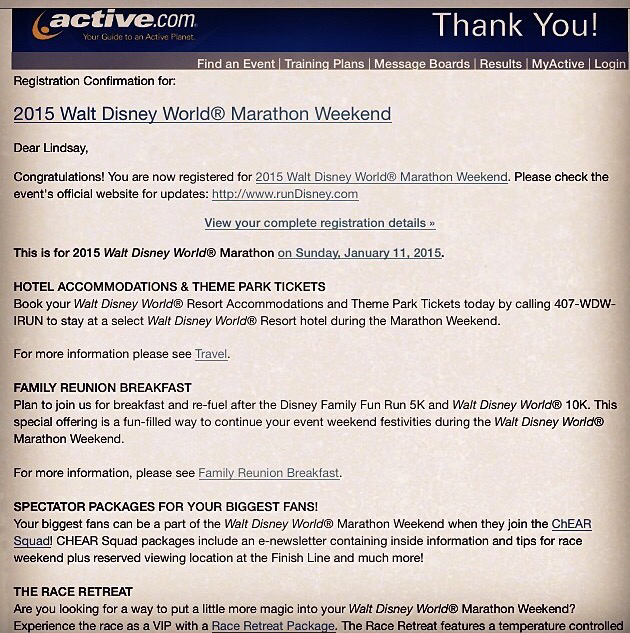 So, for my birthday, my fiancé (now husband) signed me up for the inaugural Princess Half just six weeks later. I don’t actually remember a lot about that race. I was sick. It was a cold or allergies; I don’t remember. I do remember Chris (husband) meeting me on the side of course with some orange juice and tylenol. I vividly remember crossing the finish line, I remember hearing them announce my name which was just so cool. It was awesome. And a closeup of the first medal. 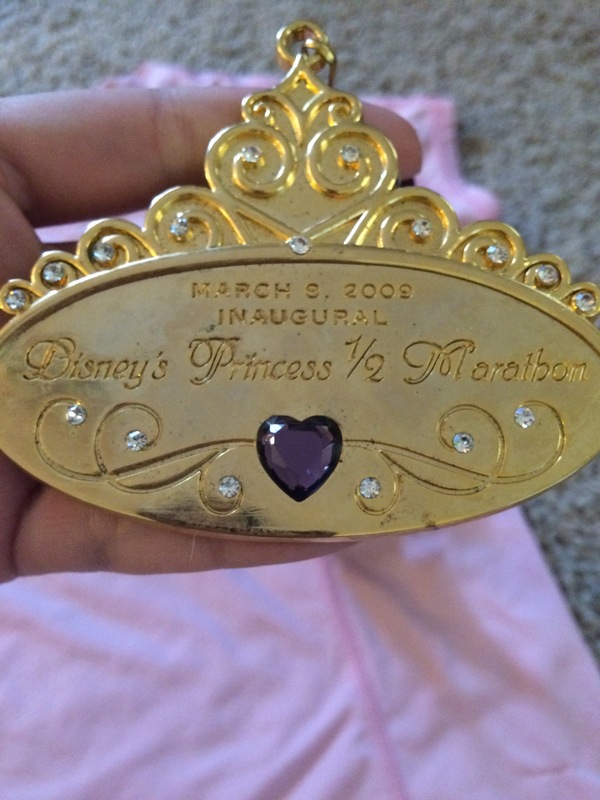 After this, I was pretty hooked on Disney running. We got married (in Disney) that April. Then I got pregnant. It was always my intention to run while I was pregnant. 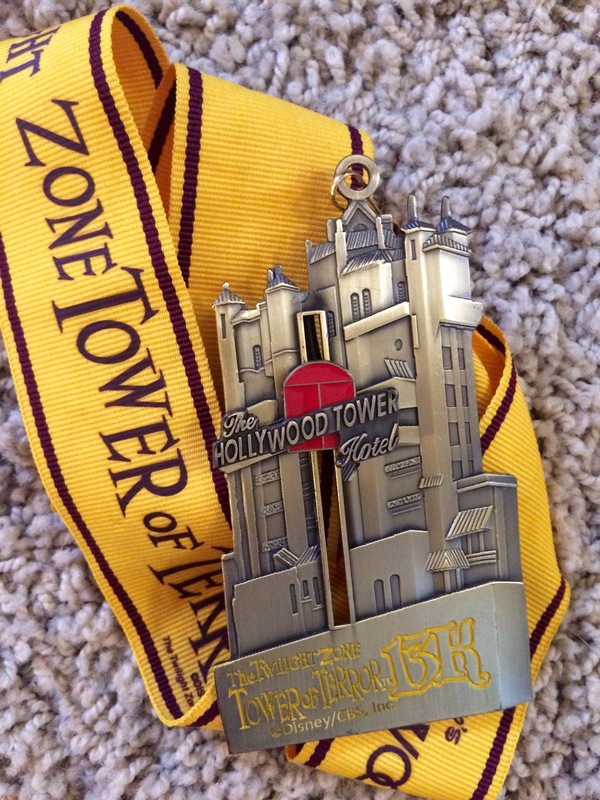 My husband, best friend and I all signed up to run the Tower of Terror 13k that October. I was 4 months pregnant and it was my first night race. I know people liked the 10 miler. I was “meh” about the 13k. It was fine but kind of boring. Very little course entertainment. By the time I finished (almost last) the lines for the after party in MGM were insane. This medal has a “real working elevator” aka, it’s on a spring. Shortly after that, after a lot of discussion with my doctor I registered for the second annual Disney Princess Half Marathon. This was scheduled to take place 6 weeks before my due date. I trained (slowly) but my daughter had other plans. I was put on bed rest and never ran that race. (In the interest of disclosure: the bed rest and early delivery had nothing to do with my running. It was just one of those things that you can’t control) So that put an end to my running for a while. I started to train again for Princess when I found out I was pregnant again. After what happened the first time, I didn’t even try to run. It wasn’t until the end of 2012 that I started running again. My youngest was 1 and I wanted to get back in shape. 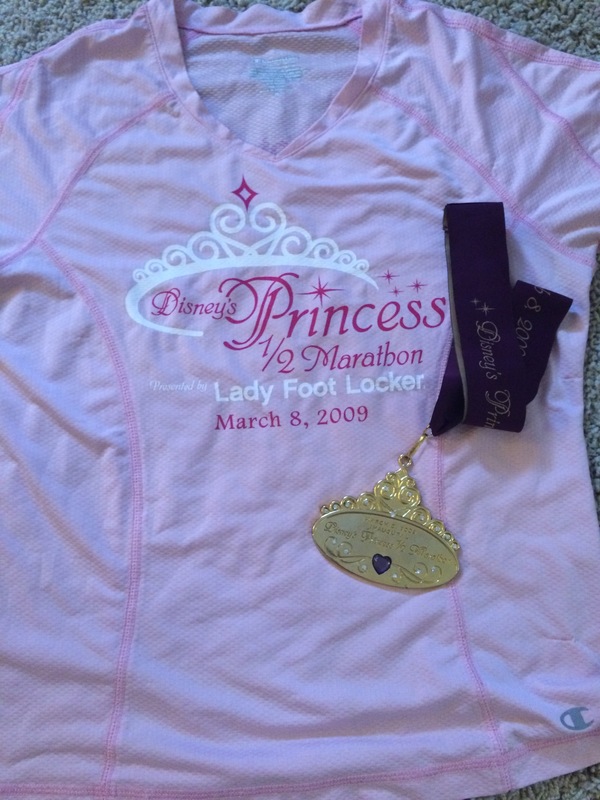 After a local 5k at the zoo, I signed up (again) for the Disney Princess Half in 2013. This time, I was ready. I was trained. This race was different than the same one in 2009. It was much more crowded. It was really humid. I walked a lot, some places (like the castle) you had to walk it was so crowded. When I finished (in a slightly embarrassing 3:22) I knew that I wanted to keep running and wanted to do a full some day. 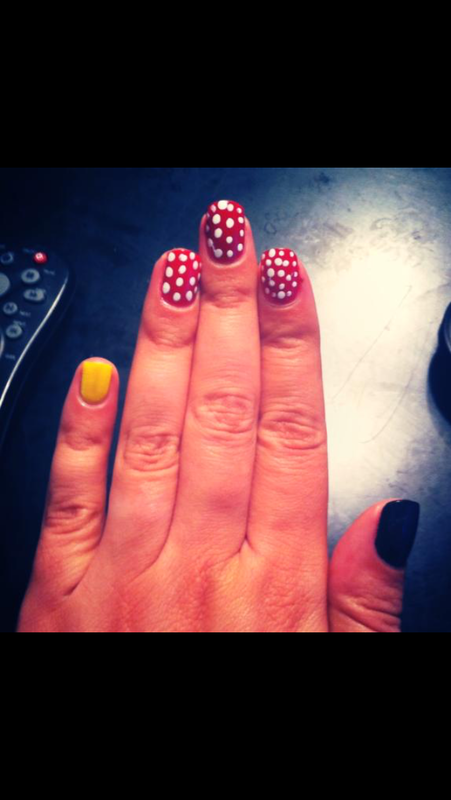 I did my Minnie inspired nails this race. I liked this shirt so much more. I wear it often. Shortly after this race, my job moved me from Tampa to NJ. 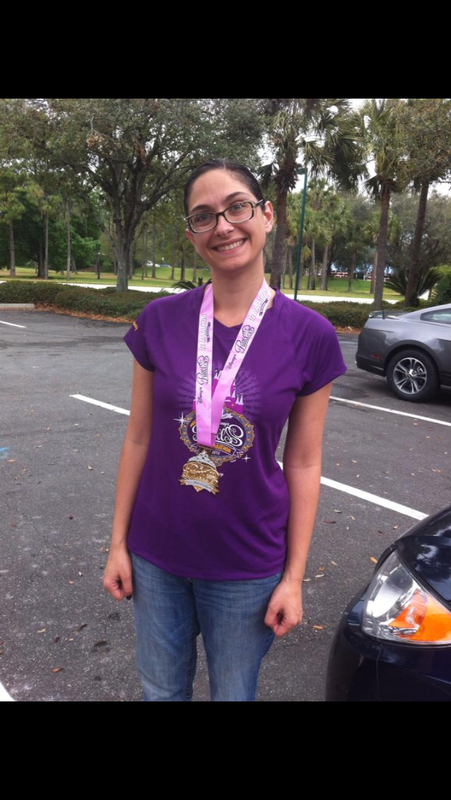 I took a short break from running while we moved and signed up for a local 10k that I loved. Then a local half (Rutgers Half) in April 2014. Shortly after completing this half, with an injury and a PR, I decided that the Disney full marathon was my next big race. Coming up next: I peer pressure my friends into training too!! Question of the day: What got you into running? You are one of the reasons I started running. Can’t wait read your next post!